Share this product and receive a $3.73 sharing discount. This lovely sterling pendant and sterling silver delicate 18" chain are made in the USA. The front of the pendant shows a lovely flower and the words GOODNESS & LOVE. The back of the pendant has been stamped with Psalm 23. 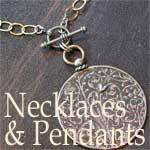 The pendant measures 3/4" x 3/5" wide. It is strung on a delicate silver 18" chain.